Hello again, Basketball World! Trey Hall signing back in for another week of my basketball diary. My school held an anti-bullying assembly in the middle of Monday's classes. Although it wasn't anyone's first time hearing this message, it's still important to recognize how others are impacted by the way we treat them. After the school day, I headed home and got a start on some homework due later in the week. That evening's workouts were fast moving and competitive. After shooting and ball handling drills, we played 5 on 5 games until the gym closed. I was still tired from traveling that weekend, so I ate and got to bed soon after getting home. I had a good stack of homework and studying to get done after school on Tuesday. With a History test coming up Thursday afternoon, I wanted to get ahead on some of the terms we needed to memorize. I studied until it was time for that evening's workout, which focused mostly on ball handling. Since we had enough guys for 5 on 5, we played up and down for the rest of the evening. Guys were competing hard, so it made the games feel more like real ones. We left the gym late, so it wasn't long before I got myself into bed for the night. With the school year winding down we've been getting a little less homework, and Wednesday happened to be one of those days. Not having any homework after school gave me a chance to take a quick nap before that evening's 8th grade end of the year reception. Since we have such a large class, our school chooses not to have a traditional 8th grade graduation ceremony. Our reception is a night for parents and family to come meet with teachers, staff, and other students while looking at the work and projects we've completed through the year. Quite a few of my family members came to support me, so it was fun to involve them in those things. After the reception we all went out for a celebration dinner, which ended the night on a fun note. I took my History test Thursday and felt pretty good about the score I'll earn when it's graded. It was another "no homework" day, so I got my house chores done as soon as I got home from school. I had an hour to rest before going to my workout, which was mostly playing 5 on 5 games. It was a good change from drills and allowed us to use some of the moves we had been working on the past few weeks. The NBA playoffs were on while I ate dinner. Once the game ended I headed right to bed for the night. Since we were going into a holiday weekend, I needed to make sure I got a haircut after school ended Friday. I spent that evening hanging out with some family but wanted to get to bed early for the Bball Spotlight Memorial Day Classic the next day. We were planning to travel early the next morning, so being tired wasn't an option. We got up Saturday morning and started our trip to Neptune earlier than planned. We figured there would be holiday traffic so no one wanted to get stuck and not make it to the first game on time. We made it to Hoop Group Headquarters at a good hour, so I had time to get prepared for our first pool play game. After a slow start, we went on to win both our pool play games by mercy rule against some competitive teams. When those were finished, the team went back to our hotel and changed before heading to the mall for dinner. We got a chance to walk around, laugh, and enjoy some bonding time off the court which is important for building chemistry. We ate, went back to the hotel and spent more time hanging out and watching the NBA playoff game in the hotel lobby. With quarterfinal games in the morning, we went to our rooms and got rest for Sunday's wake up call. The scores of Sunday's games were closer than Saturday's but teams were playing just as hard. 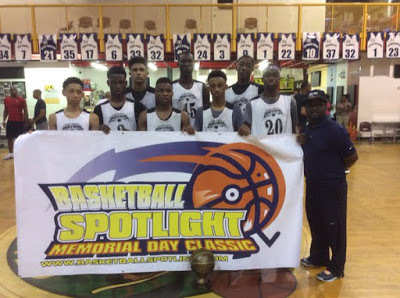 After a few slow starts we ended up winning the Memorial Day Classic, which was our second Memorial Day banner in a row. A few of my teammates stepped up and had some big games and it felt good to take pictures with the championship trophy. The Lightning 7th graders also won their age division, so it was a good day for our entire program. With everyone being tired, we got on the road right after the games and made it home early evening. We even had time to make it to a family member's wedding reception....that gave me a chance to see some family and have some good food at the same time! Not long after I walked in the door, I was showered and in bed. Best part about it all was we had no school Monday, so I looked forward to sleeping in. As this entry comes to a close I'm getting ready for the last few weeks of school and some big tournaments next month.